Well surprise, surprise! Another month has come and gone without “the RV”. Who could have imagined that? Yours truly, that’s who. I’m kicking back these days, taking care of things I neglected last year when I was kind of obsessed with researching and blogging about all of this skullduggery. However, I still find time to browse a few forums and listen in on some of the calls. The month of February saw a renewed expectancy with many, from talk of an end to Chapter 7, a deal with the Kuwaitis, the impending removal of Maliki, and the selection of Jack Lew as head of the Treasury. All of this has nothing to do with dinar investors getting rich of course, but these douchebags never miss a chance to mislead. 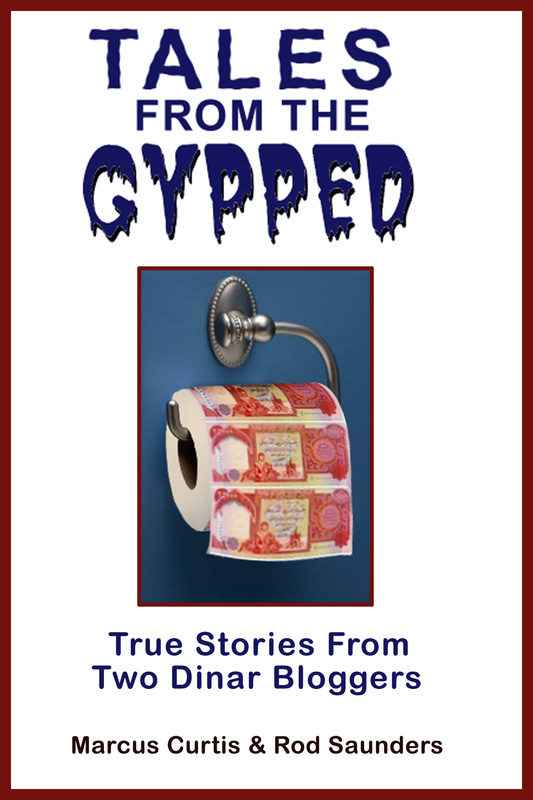 Before I go any further I’d like to talk about a story I read that has nothing directly to do with the dinar. It’s a story about a member of a famous gospel music family who has been convicted of defrauding investors of $8 million worth of Saudi oil bonds. Michael Winans Jr. reportedly used church pulpits to promote this scheme that left many victims broke, divorced, and devestated. The reason I brought this up is that many if not most dinar investors are Christian people who bought dinar because of the pitch they heard from some religious con artist who talked their language in order to sell them on the idea of buying it because it’s a once-in-a-lifetime opportunity when in fact it is headed for demonetization. This isn’t the first time nor will it be the last that people of faith were exploited by douchebags. Even in the bible the money changers were ripping people off as they came to the temple to offer their sacrifices. More recently a number of similar examples have been reported. I could offer more examples but you get the point. Lest anyone think that I’m bashing religion, I’m doing no such thing. I’m a person of faith myself. But I heed the admonition of scripture to “be wise as serpents and harmless as doves”. I’ve personally witnessed too much of this crap in the past, and this is part of what motivates me to do what I do. Get Team starts their conference calls off with prayer. WangDang starts his calls with prayer. Randy Koonce claims to be a Christian. Okie Oilman claims to be a Christian. SteveI from People’s Dinar claims to be a Christian. Roger Dorman talks about his faith. Breitling talks about faith and prayer and thanks his listeners for their prayers. Rudy Coenen (now indicted) talked about his love for Jesus. Frank Villa (Frank26) prays on his conference calls and conducts “bible studies”. BGG either has Poppy pray on their calls or does the prayer himself. Bruce from The BIG Call either prays or has FootForward pray on their calls. Is it just a coincidence that so many gurus/pumpers are devout men of faith, or is it possible that these people have discovered that church people are easy prey? Just a theory …..
Adam Montana, who claims a recent trip to Belize to confirm that all systems are go with his offshore investment (OSI) post-RV program. Actually this was from late January but I missed it in last month’s post. 9:48 AM [Adam Montana] sorry mods, I didn’t give you a heads up on this one. 9:48 AM [Adam Montana] Just a quick update, although it’s probably more relevant to our VIP and OSI members than anyone else. 9:52 AM [Adam Montana] so… until that RV is announced, we still wait. Clinton revalued the Kuwaiti dinar to balance the budget in the 90s. (14 min.) There was no Kuwaiti RV, but even if there was Desert Storm was in 1991 and Clinton’s balanced budget didn’t materialize until 1998. The 2013 budget will contain the new rate (35 mins.) These stories about the RV being in the budget have been around for at least three years, and every time they’ve been wrong. The CBI needs the 000 notes to use in international bank transactions. (63 min.) Why, pray tell, would the CBI need 000 notes for bank transactions when the whole world now handles these transactions electronically? And if Iraq is concerned about counterfeit notes as they have stated repeatedly why would they want these 000 notes to remain in circulation if they’re suddenly worth 3000 times more? Countries are now going to peg to the Iraqi dinar instead of the US dollar. (72 min.) This is too stupid to even bother with. What a asshat douche! Breitling, who did a video claiming that people who know me told him that I was foaming at the mouth angry that he rebutted me. This is pure fabrication. The fact is when he rebutted me I talked to a few people about it and was laughing at his babbling, rambling, name-calling rant. He actually had to restart his recording a couple of times because he got so worked up that he knocked his recording equipment loose. I couldn’t believe that he would put something that juvenile out there for worldwide consumption. He then went on to say that everything I accused him of was a lie except for the name-calling. However, in his rebuttal (which has now disappeared along with all of the videos I critiqued in “The Breitling Catalog“) he admitted to getting a couple of things wrong after I pointed them out, so how was I lying? Breitling also said that I never talk about the numbers, which is rubbish. As my readers know I’ve talked numbers frequently. Here’s an excerpt from a post I did back in September called “Shabibi and Stability“. These are all approximations of course. Money is constantly going in and out but this is pretty much what they’re doing. As their foreign currency reserves grow they increase the money supply to the extent necessary to maintain equilibrium resulting in a stable exchange rate. They could leave the money supply as it is and just increase the value instead, but Shabibi wants stability in the exchange rate. Now, according to the latest financials on the CBI website the M2 reached 75 trillion in December, just as I expected. So the next time you hear somebody say “nobody has been right yet” just tell them that Sammy was right about the M2 for 2012. 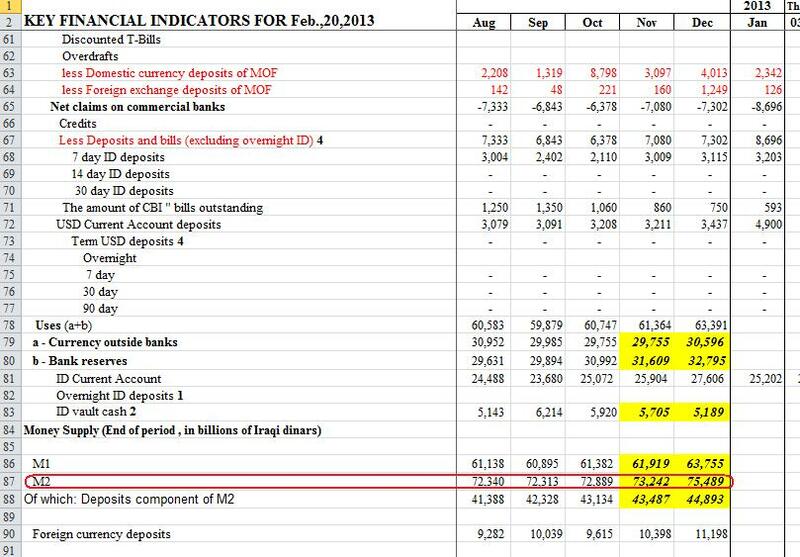 The figures in yellow are tentative, but if they hold up we have to conclude that there are 75 trillion dinar in total. Now according to a report in September of 2012 they expected their foreign currency reserves to reach $70 billion by the end of the year, so we divide $70 billion (FCR) by 75.5 trillion (M2) and we get about $.000927 which is slightly higher than the current value. Of course if they haven’t reached $70 billion in FCR yet the potential value would be lower. Those are the numbers, folks. There’s really not much room for a big RV. They could bump it up a few % with these numbers, but that’s about it as long as they’re backing the dinar 100%. Speaking of Breitling, he has been pumping REIC, a MLM real estate scheme headed by a guy named Kris Krohn. Well, take a gander at these links. As I mentioned earlier, another topic siezed upon by several pumpers recently is the appointment of Jack Lew to the head of the U.S. Treasury. Supposedly he was involved in the Kuwaiti “RV” and he’s now in place to RV the Iraqi dinar. I have been unable to find any documentation that Lew had anything to do with either Kuwait or their currency. Lew worked in the Clinton administration from 1993-1994 but the Kuwaiti “RV” would have taken place during the Bush Sr. administration in 1991 after Saddam was removed from Kuwait. Doesn’t add up. The story I’m really waiting for is the fraud and money laundering trials of Brad Huebner and Rudy Coenen. If these clowns are convicted I have a feeling that it’s “Katie bar the door” as other indictments are sure to follow. I’ll update if I hear anything.